Michigan voters participated in the states primary on January 15. (CNN) - Michigan Democrats will not to go to the polls again to choose a presidential nominee, even though the national party has refused to recognize the results of their vote in January, the party announced Friday. "We have concluded that it is not practical to conduct such a primary or caucus," the state party's executive committee said in a written statement. But they added they will continue to work with the Democratic National Committee and elected officials to ensure that the state is represented at the party convention in Denver this August. 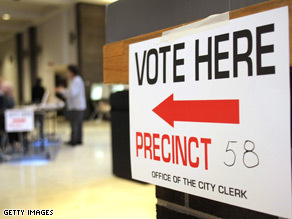 Michigan Democrats held their primary earlier than national party rules allowed. The Democratic Party responded by refusing to seat Michigan’s delegates at the convention. Many Democratic candidates, including Sen. Barack Obama, removed their names from the Michigan ballot after the DNC’s decision, leaving Sen. Hillary Clinton as the only major contender in the state. The truth comes out. She never wanted a revote! Of course, why would she. She doesn't want Michigan represented, she just wants the portion that voted for her! The way delegates are apportioned in the democratic primary, counting Florida and Michigan wouldn't do Hillary a bit of good. She would STILL be too far behind. However, the votes that Obama would receive from those two states would be enough to put him over the top. So please, Clintonites, PLEASE stop blaming Obama for not allowing their votes to count. It would only in HIS interest to allow them to count. Rules are rules. Florida and Michigan broke the rules. They shouldn't be rewarded. Actually, I think the DNC is to blame for Florida & Michigan in that they allowed these two states to break the rules in the first place. If you are leading and setting the rules, then make sure those following are abiding by the rules in the first place – no exceptions. Obviously there is a loop-hole that needs closed. What were these states thinking in making the decision to go against party rules, knowing the consequences? I haven't heard anyone asking these questions...just blaming the candidates. Did the DNC get approval from the candidates for FL & MI to move their primaries and not have the votes count? I think the media should focus on the nit-wits that bucked party rules; and in turn, the voters should vote the responsible parties out of office. This is suppose to a "democratic society" – every vote should count and no one should be in a position to make decisions regarding the voting rights of an American citizen. Wow, every hillary supporter that replies here has been doing the same thing. Quoting Sen. Clinton saying that these voters were "disenfranchised due to Obama". Do you even know what that word means? Seriously, every candidate knew these votes weren't going to count going into these primaries, and the only reason it's even up for discussion is because Clinton is losing, and as usual, she whines about it. Let's get past this junk and move on, there are better things to focus on, such as the issues at hand, or perhaps choosing the correct candidate. Jerry in Boston: I have a response for you. IF the situations were reversed, and Obama was NOT the leading Candidate, this race would have been long since over, as a matter of fact Clinton supporters would have been calling for him to quit the race for the "Good of the party"
Obama is to blame because he is the one who refused to the terms of a re-vote in Michigan.